NEW YORK, Nov. 21, 2017 /PRNewswire/ -- Concierge Auctions has announced its impressive initial lineup of 11 premier properties for its December Sale, featuring a selection of the world's finest real estate offerings — the second auction this year specifically targeting Chinese real estate investors and buyers in partnership with The Wall Street Journal and Mansion Global. Bidding will be open from December 13th–20th, with each of the 11 offerings selling Without Reserve. Prospective buyers will be able to bid via Concierge Auctions global online marketplace, ConciergeAuctions.com. Concierge Auctions began sales efforts earlier this month as a gold sponsor of The Real Deal's Third Annual Real Estate Showcase/Forum in Shanghai, gaining direct access to more than 3,500 attendees including the most desirable and hard-to-reach Chinese buyers and investors. Additionally, Concierge Auctions has again partnered with media powerhouses The Wall Street Journal and Mansion Global, adding valuable exposure and outreach to high-net-worth Chinese clients, and a co-hosted event to be held in Hong Kong on December 7th. Originally listed for $100 million, Walnut Place was designed in 1938 by world-renowned architect Maurice Fatio for Italian Count Pio Crespi, who hosted presidents, dignitaries and celebrities within the home. In 2000, Walnut Place underwent a major restoration and expansion that took nearly three years. This included 250-plus craftsmen including renowned Dallas builder John Sebastian; noted New York architect and interior designer Peter Marino; and London landscape architect Arabella Lennox-Boyd. Set on more than 25 acres and comprised of 27,092 square feet, the estate offers 10 bedrooms; a grand master wing with an antique fireplace, a private terrace, and His-and-Hers dressing rooms; formal living and dining rooms; a wet bar and lounge; an expansive wine cellar and tasting room; two home offices; a home theater; and a formal library with hardwood paneling dating to the 1820s. Additional interior details include an ornamental steel door; an original wrought-iron staircase; bay windows; parquet, hardwood, and marble floors; handcrafted millwork; and coffered ceilings. Outdoors, the property features a recreation/pool house, walking paths, stone bridges, a greenhouse, and a pond. Walnut Place also offers a 3,347-square-foot private guest house with formal dining and living rooms, a family room, office, and a patio and seating area. "It's an incredible property by all standards," stated the seller, Dallas banker, investor, and philanthropist Andy Beal. "With their unique sales process and proven track record, Concierge Auctions has my full confidence that this is the best way to showcase this one-of-a-kind property on a global scale." 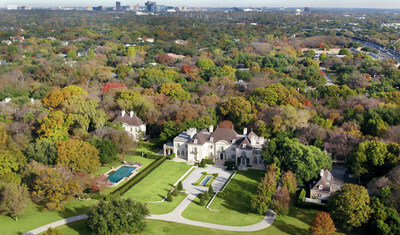 Located in exclusive Preston Hollow, the estate is just eight minutes from downtown Dallas. The estate will sell Without Reserve in cooperation with Allie Beth Allman of Allie Beth Allman & Associates. Bidding will be open from December 19th to December 20th. Currently listed for $45 million in the renowned "Estate Section" of Vero Beach, 1940 South A1A is an exclusive oceanfront family estate set on more than seven acres spanning an impressive 40,795 square feet, and provides a flexible floorplan for guests and family options. The French Mediterranean-style gated compound is comprised of a great house with dual grand master suites offering sitting rooms, limestone fireplaces, His-and-Hers dressing rooms, steam showers and soaking tubs; a chef-designed kitchen with handmade cabinetry; a climate-controlled wine cave; a cypress-paneled library; a club room; a full-service wet bar; an exercise room; professional-grade home theater; and a game room. Additional details include a vaulted entry foyer; handmade mahogany windows and doors; arched loggias on every level; cypress-beamed cathedral ceilings; Moorish arches; and walnut and limestone floors. Featuring more than 310 feet of private oceanfront, outdoor amenities include a resort-style pool with grottos and slides; a spa; outdoor kitchens; cabanas; sweeping lawns; fountains; gardens; mature oak and palm trees; and walking and cart paths. Perched within an enclave on the barrier island of Vero Beach between the picturesque Indian River and the Atlantic Ocean, 1940 South A1A is surrounded by prestigious estates and beaches. The property, which also includes two guesthouses and a caretaker's cottage, will sell Without Reserve in cooperation with Clark French, Cindy O'Dare, and Richard Boga of Premier Estate Properties. Bidding will be open from December 13th to December 14th. "Throughout my long career in luxury real estate, my team has sold some of the most magnificent estates in Florida, spanning from Miami to Palm Beach and Vero Beach. I can say with confidence that 1940 South A1A is among the best of the best, and is as expansive as it is spectacular," stated French. "This oceanfront estate is truly special. The fortunate new buyer will certainly enjoy its unparalleled lifestyle." A sustainable estate with panoramic views of Florida's Little Sarasota Bay, 7922 South Holiday Drive is an expansive gated compound set on more than three acres. Boasting more than 260 lineal feet of waterfront, the 8,505-square-foot home features a chef's kitchen with imported granite countertop; a breakfast bar and walk-in pantry; a grand master retreat including a fireplace, sitting room, private balcony and spa bath; two wet bars; a game room; and a wood-paneled office. Additional details include a porte-cochère entrance; wrap-around covered terraces; floor-to-ceiling windows and sliding doors; travertine stone flooring; tray ceilings; wrought-iron railings; and two commercial-grade elevators. Outdoors, the manicured property features a heated pool with a swim-up dining area, a hot tub, and 125-foot boat dock and two lift systems. The compound also includes hurricane protection, a whole house generator, and a temperature-controlled garage suitable for more than 15 cars. Located just one hour from Tampa, Sarasota is in close proximity to some of the most coveted beaches in the U.S., world-class shopping and dining, and the world-renowned golf club, TPC Prestancia. Previously listed for $6.975 million, the home will sell Without Reserve in cooperation with Joel Schemmel of The Schemmel Property Group, Premier Sotheby's International Realty. Bidding will be open from December 13th to December 14th. "The auction concept has gained traction in numerous Florida, national and international markets. Partnering with Concierge Auctions allows for the property to reach an untapped market of luxury homebuyers who may not have considered or may not be aware of Sarasota's incredible luxury real estate," said Schemmel. "This is one of Sarasota's most significant Bayfront estates and the largest on the market with over three-and-a-half-acres of highly-sought-after waterfront." A tranquil custom-crafted estate located on the 14th fairway of California's famed La Costa Resort Golf Course, 7229 Almaden Lane is aptly known as Hale Aikáne, or "House with Friends." Perfect for entertaining, the 6,000-square-foot home was built in 2004 and offers four bedrooms; a home theater with a nine-foot screen; a state-of-the-art kitchen; an authentic Teppanyaki Room complete with a professional cooktop and wraparound seating; a home workspace; exercise room; secluded upstairs office overlooking the golf course; several bars offering wine lockers and ice makers; and a guest suite with a private entrance. Encompassing a Hawaiian-inspired interior, the home also offers bay windows, hardwood, carpet and limestone floors, vaulted beam ceilings and a water wall inside the front foyer. Outdoors, the property comes equipped with a gated entrance; a koi pond with a walking bridge; multiple gardens; a heated lounge area with a wine bar, television and pizza oven; a patio area with a dining space and expansive sports bar; a full outdoor Viking kitchen; a tiled pool with a terraced Jacuzzi; multiple fire pits; a private putting green; and an electronically secured gate providing direct access to the La Costa Resort Golf Course. Located just over 32 miles from downtown San Diego, Hale Aikáne is in close proximity to a variety of beaches, seaside restaurants and boutiques, and the amenities of La Costa Resort Golf Course which includes a clubhouse, full gym and dining options. Previously listed for $4.999 million, the home will sell Without Reserve in cooperation with Ria Scoma of Pacific Sotheby's International Realty. Bidding will be open from December 13th to December 14th. "From the moment you step across the bridge and over the koi pond, you feel like you've arrived in a tropical resort," stated Mike Roston, who is selling the property with his wife, Ko. "It had been my family's dream to have a home within this world class resort, and this property is just that and more. It is the epitome of comfort and tranquility, and we hope a new family will enjoy it as much as we have." "Hale Aikáne is an exquisite, custom-crafted estate and I look forward to working with Concierge Auctions to bring this opportunity to one lucky buyer," Scoma added. "It's essentially a private retreat, combining resort-style amenities with incomparable elegance, ambiance and style. Hale Aikáne is the perfect home for those seeking the quintessential Southern California lifestyle with a touch of tropical refinement." A private compound situated on more than 23 acres of redwoods in California's coveted town of Woodside, 17900 Skyline Boulevard is comprised of 9,800 square feet of contemporary open living space with 22-foot ceilings and French doors that lead outside to a balcony. The gourmet kitchen includes state-of-the-art appliances, granite countertops and double ovens, while the expansive master bedroom offers panoramic views of the ocean. There are also four guest bedrooms. Exterior features include an attached six-car garage capable of storing limousines, a 700-foot driveway, a lot that can accommodate a helipad, an electric gate and five slate decks. Constructed with engineering typically reserved for government buildings, the compound offers maximum security from both earthquakes and intruders. Currently listed for $9.5 million, the property will sell Without Reserve in cooperation with Mike Kenyon of Keller Williams Bay Area Estates. Bidding will be open from December 20th to December 21st. "17900 Skyline Boulevard is truly one of the most unique properties in the San Francisco Bay Area," stated Kenyon. "Located in one of the most prestigious areas in the country, this grand estate provides the privacy and acreage seldom seen in Silicon Valley. We expect strong competition on auction day when we name the new owner of this property." In cooperation with Maria Consolino of International Luxury Homes, Ltd. Previously Listed for $3.5 million. Selling Without Reserve. In cooperation with James Sarles of Coldwell Banker James Sarles Realty. Listed for $4.56 million. Selling Without Reserve. In cooperation with Jonathan Danton of LIV Sotheby's International Realty. Previously Listed for $3.99 million. Selling Without Reserve. In cooperation with Tammie Bennett of Kuper Sotheby's International Realty. Previously Listed for $6.75 million. Selling Without Reserve. In cooperation with David Gloria of Ebby Halliday Real Estate. Listed for $14.5 million. Selling Without Reserve. In cooperation with Lauren Handrahan of Spruce Peak Realty, LLC. Previously listed for $2.95 million. Selling Without Reserve. As part of Concierge Auction's Key for Key™ giving program in partnership with Giveback Homes, each closing from the December Sale will result in a new home built for a family in need. To view all properties in Concierge Auctions' December Sale, visit https://www.conciergeauctions.com/collection/december-2017-sale. Concierge Auctions offers a commission to the buyers' representing real estate agents. See Auction Terms and Conditions for full details. For more information on any of these auctions, or if you have a remarkable property to submit for consideration to the Concierge Auctions' platform, call 212.202.2940. Concierge Auctions is the largest luxury real estate marketplace in the world. Powered by state-of-the-art technology, the company has generated over $1 billion in sales and is active in 38 US states/territories and 18 countries. Concierge curates the best properties globally, matches them with qualified buyers, and facilitates transparent, market-driven transactions in an expedited timeframe. The firm owns what is arguably the most valuable, ultra-high-net-worth client list in real estate and has been named one of America's fastest-growing companies by Inc. Magazine for the past four years.